Houses come in many shapes and sizes, so we’re sure you can appreciate that stairlifts also need to come in various configurations to suit the house. Narrow staircases come up a lot more often than you might think when it comes to installing a stairlift, and there are many ways we can work around this. Stairlift for narrow staircases do exist and there are lots of ways we can create a stairlift system that works for you. Have a look at some solutions. How narrow is a narrow staircase? This might seem like a silly question, but how narrow is a narrow staircase? What sort of size constitutes as narrow? Frankly, staircases can be built in practically any width. But for a stairlift to be installed, there usually needs to be a decent amount of space where the track and chair can be fitted with some room to spare. As a rule of thumb, the minimum width of a staircase that we can usually install a stairlift in is around 75cm (29.5 inches). 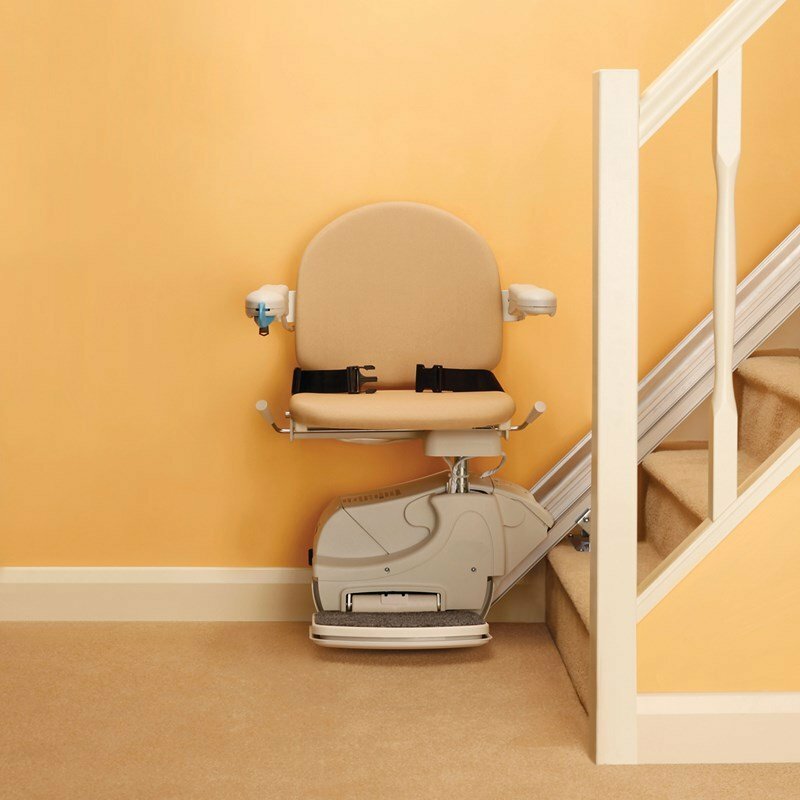 Stairlifts require at least 75cm of space on the staircase to be installed and used. One way that we can stairlifts for narrow staircases more compact is by including a foldaway seat and footplate. As you can imagine, the seat itself will take up most of the width of the staircase. Having a rigid seat sticking out across the staircase can make it difficult for other people to use the stairs with ease. So, what is the solution? Quite simply, you can use a foldaway seat to make the most of narrow staircases. Just flip the seat up and out of the way when the stairlift isn’t being used. You’ll want to include a foldaway footplate as well to save room. Simply fold the footplate up to save space. You can add both of these options to some compact stairlifts like the Simplicity + and the Handicare 2000. If you have a narrow staircase and not a lot of room at the top of bottom of your stairs, then the stairlift tracking itself can become an issue. The rail needs to extend far enough to have the chair sit safely and securely at the top or bottom of the staircase where you can get on and off it with ease. But this extra movement to the very top or very bottom of the staircase requires a bit more rail for the stairlift to move along. To save space, we can add in a hinged track at either end of the stairs to give you the ability to electrically fold it away when it’s not needed. Alternatively, you might choose to use a curved piece of track to move the chair away from the top and bottom of the staircase completely. This gives you the freedom to move the stairlift around a corner where there is more space for you to use the staircase. An electric foldaway footplate and seat can help you save space on stairlifts for narrow staircases. These steps are easy to take when you’re deciding on stairlifts for narrow staircases, but we always recommend that you get a free no-obligation stairlift assessment first. An expert will come and take a look at your house and your staircase (no matter how narrow) and prescribe the best solution available. Want to book your free stairlift assessment? Get in touch with our team! Previous articleBack to school: training Sheffield Hallam University students on the Raizer!